These four symphonies have been specially recorded for the upcoming Decca Classics �Haydn - Complete Symphonies�, a 36-CD set to be released in 2016. This will be the first Haydn symphony cycle on period instruments. Accademia Bizantina under Ottavio Dantone return to Decca, with future projects including repertoire from both Bach and Mozart. This little-known quartet of Haydn symphonies, 78-81, date from the years 1782-1784, when Haydn still served as Kapellmeister to the Esterh�zy family in their spectacular summer and winter palaces in Eszterh�za (present day Hungary) and Eisenstadt (Austria), where the music was first performed. Two absolute peaches for Haydn lovers. Both form parts of larger projects, but are eminently recommendable on their own terms, not least because each double album is priced as a single. 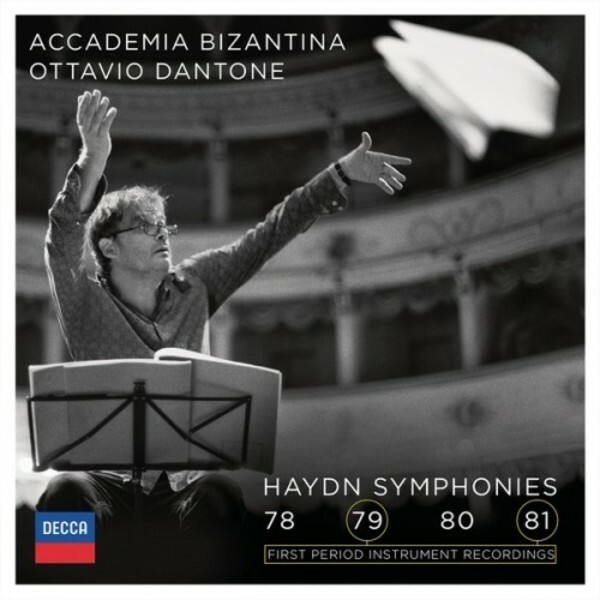 First up are Symphonies 78 to 81, designed to plug a gap in Decca�s complete set of Haydn symphonies on old instruments. The first of them, no.78, is the last work in a set of three (76-78) originally intended for an unrealised trip to London. Christopher Hogwood and his Academy of Ancient Music recorded numbers 76 and 77 (never released on Decca, though they briefly appeared on a much sought-after BBC Music Magazine disc). Now at last number 78 appears, and what a treasure it is. It may kick off in minor key Sturm und Drang mode, but that cloud soon passes, and the rest is sheer delight, especially when the playing is as vivid as it is here from the Accademia Bizantina under Ottavio Dantone. (Like Hogwood, Dantone eschews any keyboard continuo: there is no evidence that Haydn ever used one at Eszterhaza or Eisenstadt.) It�s not just the transparency that is striking about this performance, but also the warmth of the textures, and some wonderfully light flute playing in the spirited finale. Joining no.78 on this double disc is another set of three, numbers 79 to 81. Completed in 1784, this shows Haydn on the verge of full maturity, and already brilliantly confident in the genre he made so decisively his own. These performances have real grace, but also abundant wit. Highlights include the wonderful moment in the �slow� movement of no.79 when the Adagio cantabile suddenly becomes un poco allegro: a masterstroke that only Haydn could have come up with. Both this and no.81 are new to disc on old instruments, and period style makes all the difference in appreciating their many delights. There are further examples of genius in the D minor Symphony, no.80, with a wonderfully laid-back concluding passage in the first movement, and deliberately misleading syncopations to open the finale. Once again, Dantone and his musicians prove themselves worthy successors to Hogwood�s mantle. If you already have the Hogwood recordings (everything up to no.75), this is an absolutely essential and long-awaited addition; even if you don�t, it�s of a quality that demands to be heard on its own account, with sumptuous recording to match the playing. The other Haydn project of the moment is the London Haydn Quartet�s ongoing cycle of the string quartets (see here). Curiously, complete cycles of the quartets are as rare on disc as those of the symphonies, and (when they do come along) every bit as welcome. The LHQ have now reached op.50, not one of Haydn�s better known opera, being overshadowed by the brilliant op.33 which preceded it. But again, what a difference stylish playing makes to these �Cinderella� works (originally dedicated to King Frederick William II of Prussia). All the virtues with which collectors of this series will be familiar are in evidence: pure tone, sparing use of vibrato, and a wonderfully pliant approach to phrasing and tempo. And the LHQ really �get� this music, not just the jokes (as in the last two works of the set), but also the purely musical logic, the music-for-music�s sake feel of exploring motifs to their most logically satisfying extent, all within a circle of close friends. Here the recording (made at Potton Hall in Suffolk) really helps: close enough to suggest chamber music in its fullest sense, but with enough warmth to bring out the best of the instruments� characteristics. The playing throughout is superb, a fine alternative to the rather more staid and traditional approach of the Hungarian Festetics Quartet (the only period instrument alternative, and currently only available in a complete box of variable quality). Previous recordings in the LHQ series have already been greeted with superlatives, and the latest instalment will be no exception: this is shaping up to be the finest cycle of Haydn Quartets yet. Unmissable!